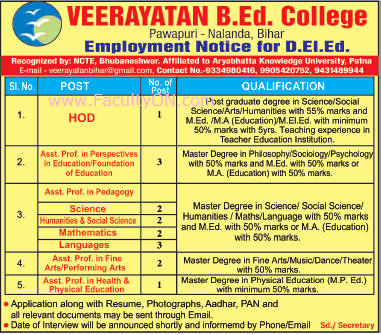 Veerayatan B.Ed College, Bihar has advertised in THE TIMES OF INDIA newspaper for the recruitment of Teaching Faculty- Assistant Professor / HOD jobs vacancies. Interested and eligible job aspirants are requested to apply as soon as possible from 26th September 2018. Check out further more details below. About College: Veerayatan decided to establish a B.Ed. College at pawapuri its own building comprising of class rooms library, laboratory, principal chamber, teacher room, staff room, Canteen etc. The campus consists of Pawapuri, with all the modem facilities. The college is situated adjacent to the famous Samossharan Temple where Lord name of the Organization. The name of the college is proposed to be "Veerayatn B.Ed. College. Master Degree in relevant subjects with M.Ed and minimum 50% of marks. Specific qualification details are available in the official notice below. You are requested to read that too.